After more than six hours in the saddle in the World Championship Road Race 2014, Poland’s Michal Kwiatkowski stormed to victory after launching a daring attack in the final kilometres, first bridging the gap to the lead group then breaking away from that group in a solo effort for the finish. With a total distance of 254kms and 4,200m of climbing, the 14-lap course was hugely challenging for all of the riders. However, a closer look at Kwiatkowski’s Quark power meter data (courtesy of Omega Pharma – Quick-Step) reveals just how superb his feat was. Are the numbers impressive or astounding? For example, a reasonably fit 80kg club rider knocking out a 10-mile time trial in 26:00 minutes needs to sustain an average power output of around 240 watts – ie not so very different. But that’s where the similarity ends; not only did Kwiatkowski average 240 watts over 6 and a half hours, it’s his ability (and that of the pros generally) to put the hammer down and keep it down that separates them from us mere mortals. The key determinant of success in road racing is ‘maximum sustainable power’ measured in watts per kilo of bodyweight (W/kg). A reasonably fit recreational rider might typically be able to sustain around 6.5W/kg, 3.0W/kg and 2.6W/kg for 1, 5 and 20 minutes respectively. A competitive club rider at cat two level might be able to manage around 8.5W/kg, 4.9W/kg and 4.3W/kg respectively. To put this in perspective, Contador’s ascent of Verbier (9.7km climb at 7.5%) in stage 15 of the 2009 Tour de France took 20mins 55secs, during which he sustained an incredible power output of 6.8W/kg. 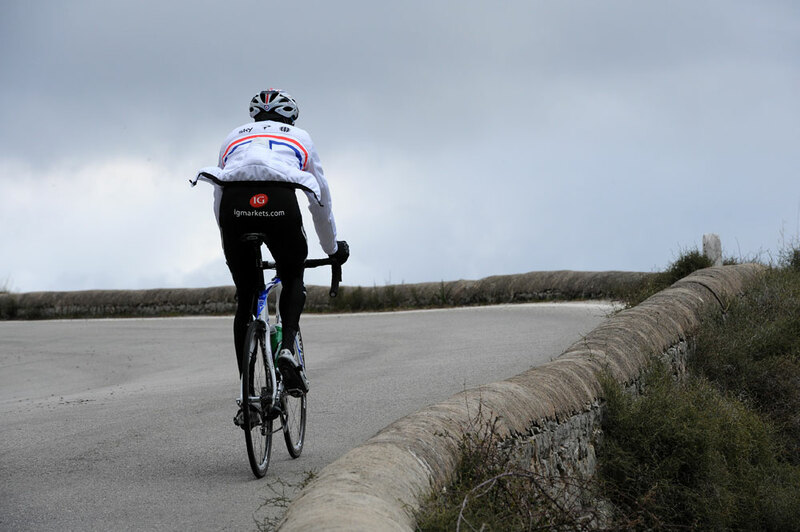 Similarly, in the run up to the 2011 Tour, Bradley Wiggins practiced 25-minute climbs sustaining 6.6W/kg throughout. Maximum peak power for sprinting is also important – for example to ‘jump’ ahead at the start of a breakaway or sprinting for the finish line. 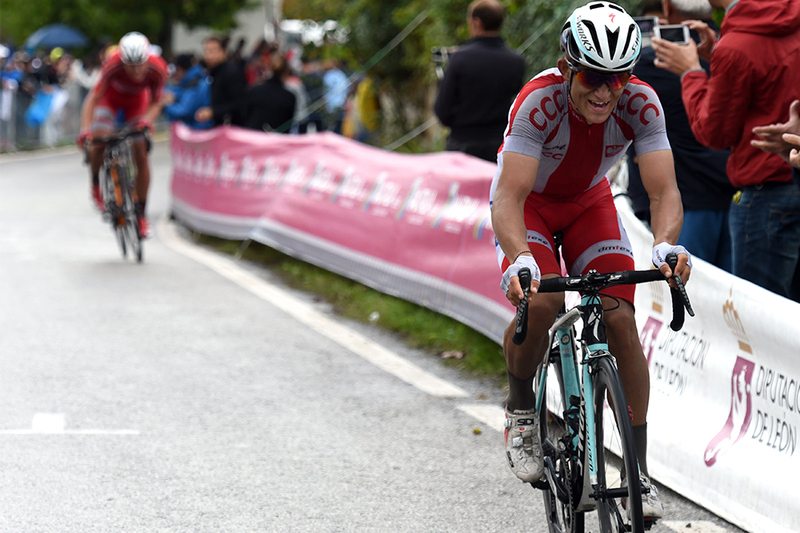 Kwiatkowski’s final attack for the line attack started after nearly 6.5 hours in the saddle and lasted around three minutes. One minute into the attack, he was powering along at 706 watts (10.4W/kg) and he sustained over 500 watts output for the entire attack – that’s over 7W/kg. It’s this ability to get the hammer down and keep it there even after hours of sapping racing that marks the pros apart. For the first 6hrs 20mins, Kwiatkowski’s teammates worked hard to protect him. By riding in his teammates’ slipstream, Kwiatkowski saved valuable energy reserves – a vital part of his winning strategy. Indeed, data from a ‘middle of the pack’ 2011 Tour de France rider (Chris Horner of Radioshack) shows that in the flat sections, speeds of 40kmh or faster could be maintained at a power output of only 150 watts, illustrating the huge benefit of drafting. Of course, Kwiatkowski had to work much harder up the hills – gravity is no respecter of slipstreaming – but here his relatively svelte weight of 68kg was a big plus, reducing his energy consumption compared to heavier riders. As well as protecting him from wind drag, the team brought Kwiatkowski to the front of the chasing pack, allowing him to descend quickly, carrying as much speed as possible into the bends and eliminating excessive braking and the need to keep re-accelerating. It enabled his muscles to derive a greater proportion of their energy aerobically – ie without the production of excessive lactate. Although muscles can clear lactate after hard efforts during a race, it invariably comes at a price of greater fatigue later on in the race. Of course, Kwiatkowski’s lactate levels would have rocketed during the final attack but as he was only minutes from the finishing line, this wasn’t an issue! It enabled his muscles to burn more fat for energy while conserving precious stores of muscle glycogen – the only source of energy for the very high-intensity effort that was to follow in the final moments of the race. With all the right foundations in place, Kwiatkowski launched his attack by jumping away from the main chasing group to catch the lead group. To do this, he unleashed a half-minute burst averaging 436 watts (6.43W/kg) at 53kmh, during which his peak power hit 928 watts – a key point in the race. After catching the lead group, Kwiatkowski took a very short breather. But with only a narrow lead over the chasing peloton that included many of the favourites, he couldn’t afford to sit in the lead group too long. After less than a minute of recovery, he attacked again – this time for the finish line. His sprint away from the lead group lasted around 3 minutes, during which he sustained over 500 watts, peaking over 700 watts. Having got away, he kept the pressure on right to the line, sustaining an average power of 415 watts and a speed of 60kmh for the final 1.7km. To produce these numbers at anytime is extremely impressive, and something that most cyclists could only dream of. To produce them right at the end of a 253km, 6.5-hour race through mountainous terrain however, is testament to Kwiatkowski’s extraordinary ability.